There is a pleathora of information hitting the internet waves regarding productivity. With countless articles, videos or podcasts focused on the topic – it’s a lot of information to sift through. Right? Our collective obsession with getting more done in less time seems like it’s the top goal we all have. How can we be more productive? How can we get more work done quicker? How can we better manage our time? How can we maintain a work-life balance? You have likely asked yourself all of these questions at some point…. Naturally we all end up scouring the internet, looking for an answer to our productivity troubles. Yep in the end we end up wasting more time in the process than ever! To help you out and cut down that wasted research time, we have curated a list of the best productivity tools. This blog post will be your go-to guide to everything productivity related. Bookmark this blog post so you never have to Google ‘productivity tools’ again! Productivity Tools that Actually Help You Be More Productive! What’s more productive than having a schedule in place and knowing exactly what to do and when? For all your scheduling worries, Calendly is there to help. 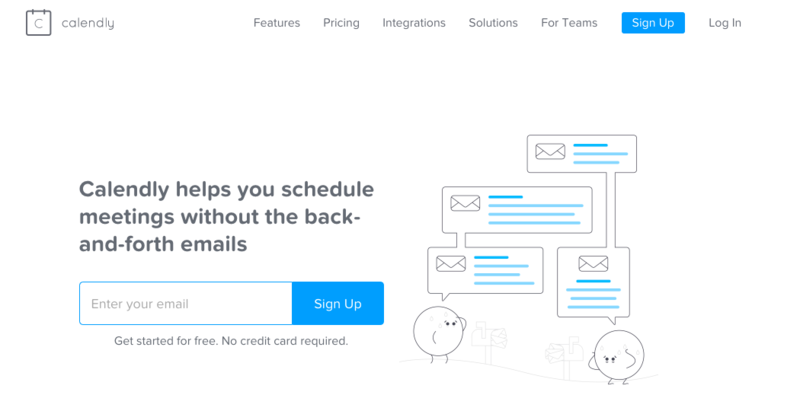 Calendly aims to solve the headache of scheduling meetings and video conferences, especially if you have a remote team. Just let Calendly know your availability preferences and it’ll do the work for you. Once you have created your calendar, you can share your Calendly link via email or embed it on your website. Calendly makes it super easy to book meetings by getting rid of the endless back and forth via email to find a convenient time. As far as good productivity tools go, Calendly is a must have. The biggest productivity killer in the office is coincidently the numerous productivity tools we end up using in the first place. Messaging someone on Skype, email, collaborating on Google Docs, finding content stored in Dropbox, etc. all drains our productivity as we keep juggling between apps and we don’t seem to make any progress with the actual work. 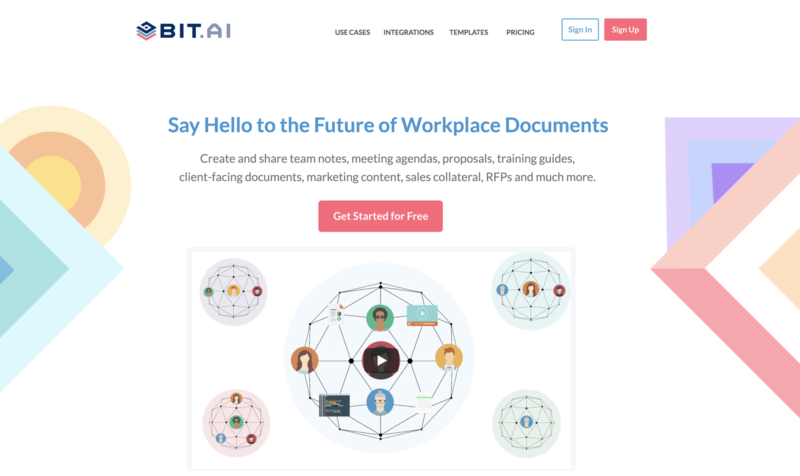 This is why we all need Bit, a new-age document management and collaboration tool that helps teams to collaborate, share, track and manage all company documents, files, and other content in one place. Bit is the ultimate productivity tool as it brings all your company documentation, media files, and knowledge under one smart roof. Collaborate on interactive workplace documents where all of your digital content from Google Spreadsheets, forms, Airtable databases and much more can live and be accessible inside of them. Documents can go from personal notes to team research, to coordinated documents and client-facing material that can be shared and track to get intelligent engagement insights. Amazing content management capabilities as Bit’s content library that allows teams to save images, files and any type of digital content you add to your documents (or workspaces) so that you can access and reuse them easily. According to research, people who listened to music while working complete their tasks more quickly and had better ideas overall than those who didn’t. If you thinking of increasing your productivity with the power of music, you should try out Brain.fm. Brain.fm works with teams of scientists and composers to engineer music specifically designed to help you achieve and sustain deep focus. By combining functional music design with our science first approach and patented technology, Brain.fm create music with a purpose- helping people get more done, feel more relaxed, or get better sleep! With the promise of delivering noticeable results within 15minutes of use, Brain.fm is a must try productivity tool! Pop-up alerts remind you when you stray into time-wasting websites. Daily time reports show you your metrics for the day. Set yourself a target and try to beat it. Distractions play a huge role in hampering our progress in life, and it plays an even bigger role when you are trying to stay focused at work. This is why we recommend you try out StayFocusd, a chrome extension that blocks the websites you ask it to and prevents you from getting distracted. StayFocusd increases your productivity and forces you to focus on your work by limiting the amount of time that you can spend on time-wasting websites. It’s highly customizable as you can set it to block entire websites, subdomains or even specific in-page content (videos, games, images, forms, etc). Once your allotted time has been used up, the sites you have blocked will be inaccessible for the rest of the day. With over 8 million daily active users (3 million of which are paid users! ), Slack is the go-to communication app for remote teams. Slack allows teams to create chat groups called ‘channels’ for transparent, open communication. In a short amount of time, Slack has gained significant popularity with over 35,000+ paid companies like IBM and Airbnb. Slack is easy to use, has an intuitive design, and makes communication fun and efficient and might just cure your email troubles for good. Slack integrates with nearly every third-party apps and makes file sharing a breeze. Slack offers apps for iOS and Android to keep the communication going wherever you go. Creating and following a to-do list help many achieve greater productivity in their professional as well as personal lives. This is because having a to-do list in place allows you to clear your mind and go about your work in a strategic and systematic manner. Todoist, a task manager/to-do list creator tool, has a clean and simple interface that lets you create tasks in minutes. Just go to Todoist, create a task, set a due date (or a recurring due date), organize the task into a project and add a due date. You can even share projects or delegate a task to a teammate and add a priority level so you know what’s important and what can wait. The app is available for desktop as well as your smartphone so you can quickly take a glance at your tasks on the go. Email is well-known to be a productivity killer as its so easy to go down that rabbit-hole and try to reach “inbox zero”. Although, being an indispensable part of our workflow, we can’t really get rid of email either. So, to help you out with your email mess, we bring you Boomerang. Boomerang is a Gmail plugin that allows you to write an email now and schedule it to be sent at a later date. Just click on the send later option and boomerang will remind you to send the email on the date/time you have set. One neat feature of Boomerang is the ability to, well, ‘Boomerang’ your emails. There are times when you want to read an email or a newsletter from your favorite publication but don’t have the time to read it just then. How many times doe this happen to you at work- you are searching for something work-related online, only to get distracted and end up reading an interesting article or watching a YouTube video? A bit too many times that you’d like to admit, right? Well, don’t worry, Pocket got you covered. Dubbed as the save button for the web, Pocket is one the top content curation platforms out there that help you save articles, videos, or nearly any other web content in Pocket that you want to read, watch, or share at a later time. Its chrome extension makes it easy for people to click add web content to their Pocket dashboard as they browse the web. It also doubles as a discovery platform where users can browse through interesting new content which others are reading or “pocketing”. Zoom video communications were named a 2018 Gartner Peer Insights Customers’ choice for meeting solutions and is must have productivity tool. Whether you want to conduct an online meeting, video webinar, or just need to share screens with your IT team, Zoom is the tool for you. A perfect productivity tool for remote teams, Zoom’s free account option lets you share screens with up to 25 participants and host an unlimited amount of meetings. However, each meeting can be only 40 minutes long. 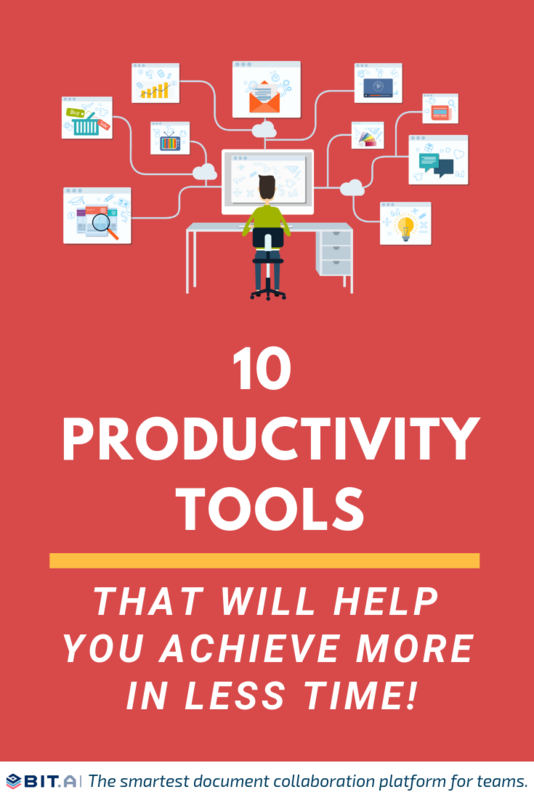 That concludes our list of some of the best productivity tools out there! These tools will not magically add more hours in your day, but they will certainly help you achieve more in the time you’ve got. If we missed out on your favorite productivity tool, do let us know by tweeting us @bit_docs. Cheers!